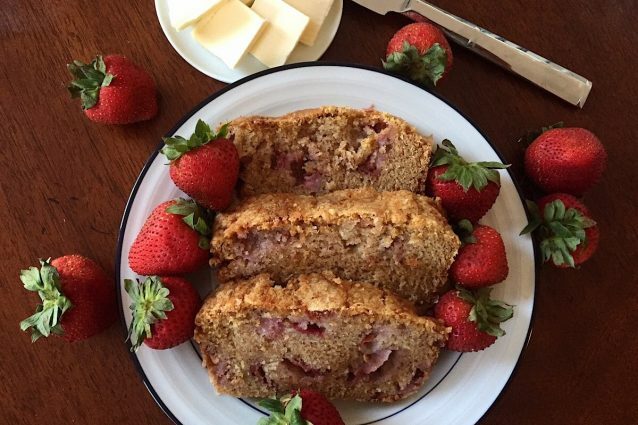 While this strawberry bread would probably be considered a breakfast food due to its muffin like qualities, it is so good that it can definitely pass for a dessert! Fresh strawberries are key in making this bread super moist and flavorful so try to avoid using any frozen berries or freeze dried fruits. This recipe will also work fantastically if you choose to add other types of berries so get creative! Place the flour, 1 cup sugar, cinnamon, salt, and baking soda in a large bowl and stir to mix together. Add the eggs, coconut oil and vanilla to the dry ingredients and stir the batter together until it is nice and smooth. Mix the strawberries into the batter and then spread the batter in a greased and floured loaf pan. Bake the strawberry bread for about 45-50 minutes in a 350 ̊F oven. The strawberry bread should be set in the center and spring back to the touch. -If you do not have coconut oil, vegetable oil will work fine as a substitute. – This recipe also makes great muffins and mini muffins. Scoop the batter into a paper lined muffin tray instead of a loaf pan. Bake for about 20 minutes for regular sized muffins or 12 minutes for mini muffins. Hot Ham and Cheese Sandwich with strawberry Jam: the amazing way to use jam! Caramel french toast: an easy recipe with no oven needed! 3 edible baskets recipes to try! 4 fluffy desserts you will fall in love with!